Every team playing the San Francisco 49ers is warned about their defense. The potency of a single entity hasn’t received this much hype since Ryan Gosling came onto the scene. So let’s firstly tip our hat to the likes of defensive end Justin Smith, who with torn triceps is still the glue of a stout Niners line. 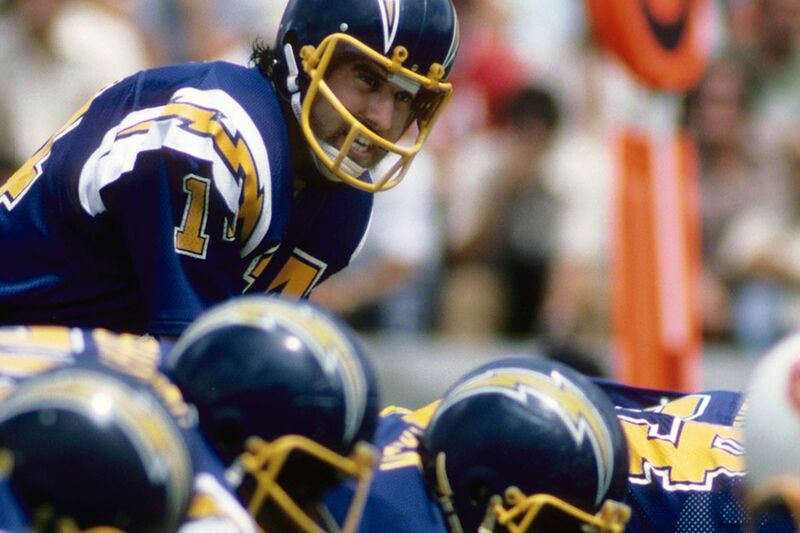 The front seven will certainly penetrate the Baltimore Ravens’ wall on Super Bowl Sunday. They will race toward the unhurried Baltimore quarterback, Joe Flacco, and try to absorb the human cannonball, Ray Rice. And, if that strategy falls short, then the 49ers linebacker await, like lasers protecting a vault. Nobody but Catherine Zeta-Jones in those black tights could break through. That’s what I hear, anyway. Contrary to popular belief and reams of stats, both of which tell us the 49ers’ defense ranks among the league’s strongest, San Francisco has its flaws. While its front is bulky and relentless, and its linebackers scarier than NFL veterans squeezed behind pre-game desks, the secondary is vulnerable. Try plough the ball up the middle, as the Atlanta Falcons did during the NFC championship game, and the San Francisco line will arrive faster than the gold diggers of 1849 to California. But on the post route---straight upfield and then inside---or on any variation of a deep ball, the team’s secondary can be caught napping. Sure, Dashon Goldson and Terrell Brown make tackles, but the ball moves faster than the player, and few move it beyond defensive backs like Flacco. The trouble is the Niners corners aren’t brawny, so larger receivers can outmuscle them, even if they correctly read a throw. This means if Flacco can lead his wideouts---especially the speedy Torrey Smith and the soft-handed Anquan Boldin---deep and away from the safeties, I fully expect the Ravens to tear up the Niners back end. 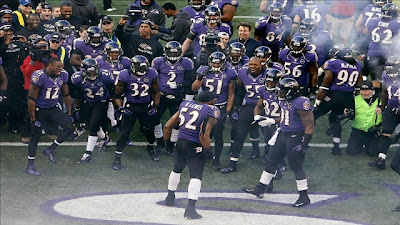 Ultimately, once the smoke clears from the fireworks and Ray Lewis has finished his Fred Astaire impression, I think Baltimore’s defense takes centre stage. Their key men are slower, yes, and greyer, sure, but this is just one game folks. And when you’re playing for your legacy, as Lewis is, not even Jim Harbaugh’s bravado is going to save you. I know what you’re thinking, especially if you are one of those people who has fallen for Niners quarterback, Colin Kaepernick. He’s tall, lean and illusive, fleet-footed and hard to contain once he swings around the edge. That’s apparently his thing---circumnavigation. But from the pocket, the young quarterback has the same options as every other: a hand-off, a mimicked hand-off and a throw. It’s baffling that most defenses can’t work this out, isn’t it? Well, most defenses, like that of the Green Bay Packers, or the New Orleans Saints, are average at best. They are not the black and blue Ravens. Everything changes in The Big One, we must remind ourselves. 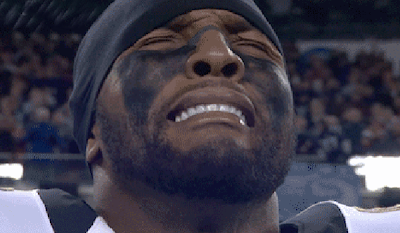 Ray Lewis, in his last hurrah, will hold in the hole (mostly because he’ll be gassed before the first whistle even blows!). Still, in this instance, while creakier and probably crabbier on a Sunday morning than most players, the Ravens will use all that’s left in the tank to snuff out Kaepernick and his high-stepping hoopla. Lewis, Terrell Suggs and company will be braced, both where they ache and for all oncoming runners, too. They may forgo some yards to Frank Gore, who is a bulldozer, but as long as the six-pointers are limited it won’t matter. Does anyone really have faith in David Akers at this stage anyway? Corey Graham and Cary Williams have been the playoffs’ best corners with 50 tackles and assists between them. They’ll make life hard for the Niners receivers. And for all the talk about Patrick Willis, a ferocious defender and intimidating presence, the Ravens linebackers are still the best in the business, almost purely because their reputation precedes them. It’s akin to Sir Anthony Hopkins now in the twilight of his career: at this point he could star in a Hot Tub Time Machine sequel and win an Oscar. Listen, like you, I caught just a snippet of Lewis’ rantings after the championship game, but wasn’t it enough? The Ravens are on a mission to lose nevermore. I thought it'd be a cold day in, well, Cleveland, before its professional football club sold out (and we're not talking about ticket sales). The Browns, in my mind, are the NFL's benchmark for tradition, old school toughness, retro cool, and most importantly, a respectable aversion to change. These are reasons to like them, despite their hapless performances year after year. But with the news Cleveland Browns Stadium will adopt corporate sponsorship for the first time this year, some love was lost. The old arena has a shiny new name, FirstEnergy Stadium, and presumably those wonderful plain orange helmets are the next to go (though owner Jimmy Haslam assures us they won't be touched). 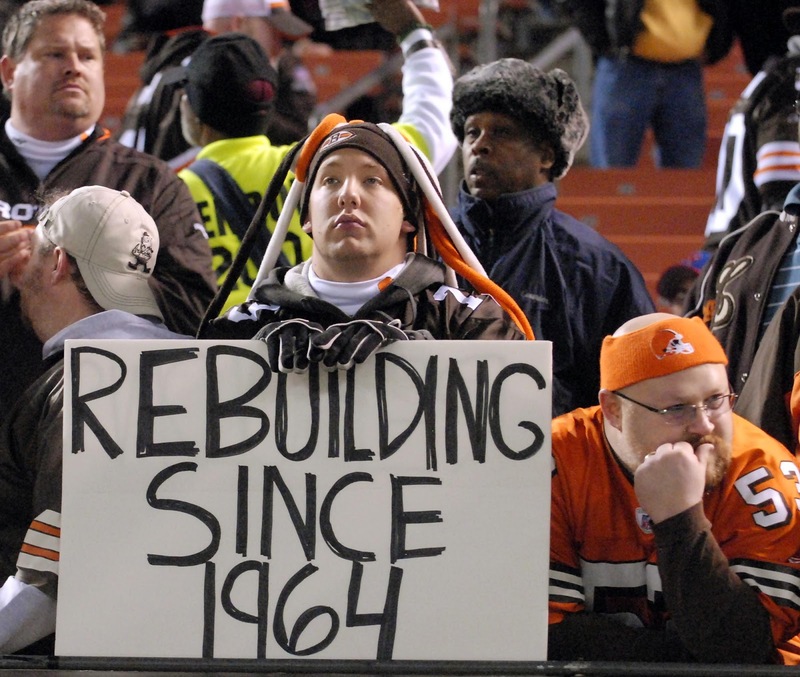 At least FirstEnergy is an Akron, Ohio-based company with previous dealings with the Browns. And, I can at least understand that the club might need more cash, because they certainly haven't been mailed any "winner's checks" lately. Amazingly, the Brownies haven't capitalized on stadium-naming rights since occupying Cleveland Browns Stadium following their 1999 rebirth. Apparently this marks a new era in Cleveland football. "This deal is a great example of why we feel very good about the direction our organization is headed," said team CEO Joe Bannerand. "We believe it can serve as a catalyst for many other positive developments moving forward." And yet, I can't help but feel club brass didn't explore all arena name possibilities for this much maligned, but widely loved NFL team. Houston Texans quarterback Matt Schaub doesn't have a big game in him, the experts are telling us. The New England Patriots are waiting mercilessly to annihilate Schaub and his pals in the divisional playoff round, and there’s nothing the NFL’s fourth best passer---according to ESPN’s passer rating stat---can do about it. Houston, in other words, not only has a problem, but faces a freaking impossibility! Schaub told The New York Times this week that the Texans are looking to take the next step. “The expectations have grown and grown around here, especially in the locker room, that we expect to play good ball and to move on,” Schaub said. You have to feel for the guy because he does everything right. He throws for 4,000 yards like he’s playing Tecmo Bowl, and his touchdown to interception ratio reads like Christina Hendricks measurements---top heavy. He’s also unassuming and modest, a quiet assassin, if you will. But despite the cool temperament, and even though he racks up jaw-dropping stats---he’s done so since his stellar high school and college years---we know, or at least are constantly told, it takes more to seize glory. So perhaps it’s time for Schaub to call it quits, think about a new profession, and focus on something, well, a little more him. We’ve come up with a few suggestions, just as a guide, anticipating Matt will be in no mood to think about such weighty things after the Texans turn in seven points to the Pats’ 50. Rabbi or Priest – he has the hair-style already, the solemn look, plus the patience and self-forgiveness. Accountant – the man loves numbers, just look at all those yards. Surf shop clerk – certainly a more relaxed, low scrutiny, people person type gig. Couples therapist – his soothing voice is less hands-under-center and more loveseat. Cameo actor as “big brother” or “popular jock” – he’s got the height, looks, and prerequisite insecurity. Major League pitcher - for no reason other than his zip and preference for short deliveries. Also, rarely a game goes by where he doesn't wipe his brow as if atop the mound in the seventh. New York Jets coach Rex Ryan was spotted sun-baking in the Bahamas this week, and while The NY Daily News was likely thrilled by the scoop, they surely didn’t anticipate the lens being colored by Rex’s weird tattoo. 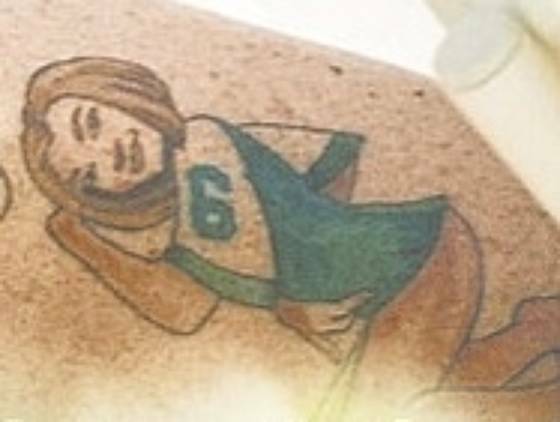 Yes, the subtle-as-a-sledgehammer leader of the Jets sported a tat of a woman—presumably his his wife Michelle—wearing nothing but a green No. 6 jersey and smile. And you thought Tebow was the only one running the Wildcat! Once everybody digested the disturbing nature of the rendering, questions of its authenticity quickly arose, like the stench of a Sanchez throw. 1. If Rex Ryan was to take a vacation with his wife, he would most likely book…. 3. Which quarterback’s jersey would Rex most likely want his wife to wear to bed? 4. Which half-naked female would Rex most likely have tattooed?